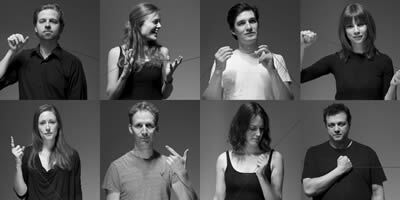 Laws of Motion playing at Jam Factory is a perfect fusion of cast, director, script and venue. It’s rare for every element of a show to coalesce in this manner: seeing it happen before your eyes is a wonderful thing to behold. There are bumps, scrapes and skids along the way, but the energy, verve, vitality and all-around oomph of this company deliver on every promise, and every possibility, offered by a truly wonderful script. The show consists of a series of vignettes from the lives of everyday New Yorkers: the yuppies with a decaying marriage; young love at a Kinko’s; sessions with the neighbourhood domme. In the hands of a less talented company, this would be extremely jarring, with the dramatic focus and overall message swinging wildly from scene to scene – but not here. These people understand author Ashlin Halfnight’s messages about the unity, alienation, confinement and claustrophobia we all feel in urban spaces, and it’s clear that this understanding has informed almost every decision. And these decisions are unconventional. The lighting designer shines bright beams in our eyes, and it works; the director has the actors do all their own staging business in full view of the audience, and it works; lines are read with backs to the audience, with faces obscured, with lights at little more than a gentle twilight, and it works. It’s rare to see the atmosphere of a show so completely tailored to the needs of the script and production: this company doesn’t just succeed, they hit it out of the park. This staging puts the actors on a sort of catwalk with the audience on both sides. Aside from buttressing several of the core points about urban alienation, this means that sitting just a few seats to the left or right means you might see a completely different show. This makes me reluctant to tease out favourites among the cast. How might I feel if I were staring at that character from another angle? Would my perceptions change if I sat on the other side of the stage? But here, too, the all-around excellence of the show shines through: these aren’t questions I’d even entertain at any other show; the fact that this company raises them–and relates them to the plot!–is remarkable. Indiscreetly, though, I felt that David Tompa turned in an excellent Christopher, Dani Kind introduces an odd sort of moral centre in Jolene, and Kate Zeigler has some of the best lines of the evening in a role I don’t want to describe for risk of spoilers. And a special mention for lighting designer Sandra Marcroft, who injects some truly wonderful effects, especially an absolutely heart-stopping moment towards the end of the evening. Mostly I’m just floored. I want to see this show again: I want to stare across the aisle at the other half of the audience and wonder what they’re seeing. I want to continue unpeeling the layers of meaning and subtext that the director has laced throughout this show. I want to revisit these characters and see how my own reactions change in light of what I now know. That may be this show’s greatest gift of all: none of these characters or situations are all that unusual, but the take, spin and approach imbue them with such charm, clarity, insight and meaning that we can’t bring ourselves to look away. – Laws of Motion is playing at the Jam Factory Co. (2 Matilda St., near Broadview & Queen) through March 15th, 2013. – Performances run Tuesday through Sunday at 8 PM. – Tickets can be purchased online or at the venue immediately before performances. – Strobe effects are used throughout this production.